Open Solutions has benefited in many ways over the years from open source software. We actively try to contribute back through small changes and patches (on an individual basis by our developers directly) but also by releasing software projects such as those below. The ViMbAdmin project (vim-be-admin) provides an web based virtual mailbox administration system to allow mail administrators to easily manage domains, mailboxes and aliases. You can read more about it, access a live on-line demo and view screen shots here. 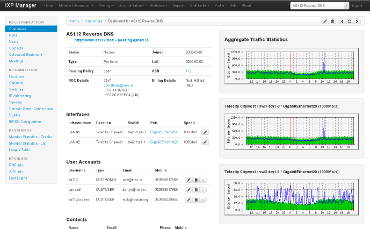 NOCtools NOCtools is a mixed bag of tools and utilities that are useful for NOC engineers. This project originally started out as a way to highlight and utilise our OSS_SNMP library (see below). It since grew into a way to graphically present information on network topology that is normally difficult and cumbersome to do by logging into individual devices. Such information includes a discovered L2 topology by CDP, using this to present rapid-PVST port roles and so forth. See the GitHub project page. OSS_SNMP A PHP SNMP library for people who hate SNMP, MIBs and OIDs! A lot of us hate SNMP. But we have to use it on a daily basis. Now, don't get me wrong, SNMP is an essential tool in the trade of network engineering but it can also be a serious PITA when you need to integrate it into tools. Finding MIBs, OIBs, making them work, translating them, cross-vendor translations, etc, are all awkward at best. For PHP applications, we hope OSS_SNMP will be a killer tool. Minify is a JS and CSS minifier toolkit (with support for generating templates for engines such as Smarty). Its main features include auto discovery of CSS/JS files; minification of these files into a single bundle; automatically generate template include files; and versioning for those using CDNs. Get the tool and read more about it on our GitHub project page. We create a lot of Nagios installations for our own systems, for customer systems which we manage and as a service for our customers. We've written a lot of custom Nagios plugins over the years as part of this process. We are now making a concerted effort to find them, clean them, maintain them centrally and release them for the good of others. To that end, we have created a repository on GitHub where you can find more information and download the plugins. IXP Manager is primarily a web application with associated scripts and utilities which will allow IXPs to manage new customers, provision new connections and services and monitor traffic usage. It also has a self contained customer portal allowing IXP members to view their IXP traffic statistics and a unique tool called My Peering Manager enabling IXP members to request, manage and track peerings with other members.